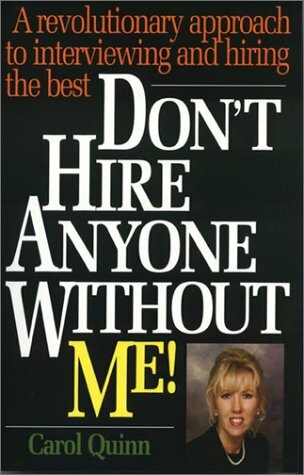 This is the original book written about Motivation-Based Interviewing. It covers all the 'how-to' aspects of interviewing and assessing job applicants to determine if they will perform at the level of a High Performer...if hired. Today's employers know that savvy job seekers are capable of Oscar(tm)-Winning performances during interviews. But how can they separate the real performers from the impostors? Here is a book that gives employers the ammunition they need to master the science of hiring truly productive people. Learn how to avoid the most common pitfalls of hiring, such as making decisions based on skills alone, or making a hiring decision on a "gut feeling" about a candidate. Get simple ways to ask better questions and to understand what the applicant's answers are really telling you. This is a practical, how-to book that shows decision-makers how to incorporate "Motivation-Based Interviewing" into their hiring process quickly, affording them the opportunity to gain a significant edge on their competition. This revolutionary approach to interviewing is simple yet so effective it is destined to become commonplace in the business world.